This is the Personal Accufit main form. 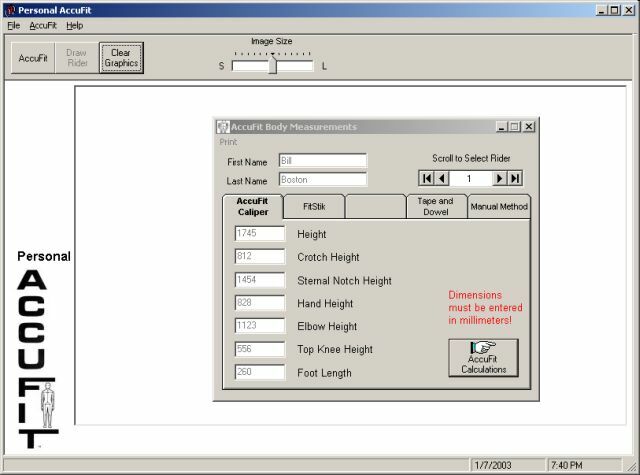 In the center of the main form is the Accufit Body Measurement form. There are 4 measuring methods available with detailed measuring instructions for each method. The first record has been populated with my measurements so that you can get used to the functionality before you take your own measurements. There are 6 additional records available so that you can help your family and close friends attain the the best bike fit possible. Let's take a look at the form for the Manual Method.